Are you wondering exactly what is VAP? Let’s dig into it a little deeper. VAP stands for Ventilator-Associated Pneumonia and is basically pneumonia that develops 48 hours or longer after mechanical ventilation is initiated on a patient. What is the problem with VAP? An infection is described as a breach in a body’s defense system by harmful microorganisms such as bacteria, viruses, and parasites which are not part of the normal flora (the naturally occurring bacteria of the human body). Once an infiltration is made, microbes would start proliferating which can lead to certain diseases. Normally, if a person gets sick and requires further medical attention, they will be admitted to a hospital to receive treatment for recovery. While hospitals are supposedly a healing sanctuary for most medically ill people, acquiring an infection during one’s stay is possible and does occur far more likely than it should. These infections are called Nosocomial Infections or hospital-acquired infections. The most common of these occur from a surgical wound or site. Other frequent nosocomial infections stem from bloodstream infections, urinary tract infections, and cases of pneumonia. According to the CDC, about 2 million people in the US alone acquire nosocomial infections yearly and this leads to 20,000 mortalities. The second most prevalent nosocomial infection also attributes as the leading cause of death due to hospital-acquired infections: ventilator-associated pneumonia (VAP). VAP is a lung infection that develops in patients undergoing mechanical ventilation for more than 48 hours. The incidence is high and it accounts for 22.8% of all patients who end up on the ventilation. It is also the most common infection in the intensive care unit and it accounts for almost half of all the antibiotics administered in the ICU. 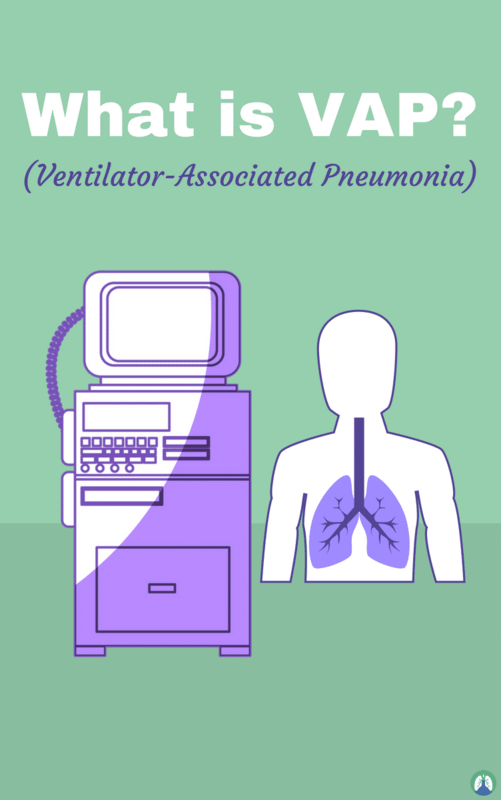 There are two kinds of ventilator-associated pneumonia. The first one is the early-onset VAP which happens 48 to 96 hours (4 days) after intubation. It is caused by an antibiotic-sensitive bacterium. The second is late-onset VAP, which develops after 4 days from when the patient is initially intubated. It is usually caused by an antibiotic-resistant bacterium. What are the causes of ventilator-associated pneumonia? An infection arises when the host’s power to defend itself against invading pathogens is compromised. The declined state of the immune system can be due to different factors such as immunosuppressive medications, underlying diseases, and an altered mental state. Pneumonia is a lung infection that causes alveoli inflammation. These alveoli contain purulent materials that cause a cough with secretions, fever, and difficulty of breathing. For patients with ventilator-associated pneumonia, the primary way for developing an infection would be a colonization of pathogens acquired in the intensive care setting. These pathogens can be acquired through contaminated medical equipment, hands, and even the uniforms of medical providers. Colonization of bacteria and microbes present in the normal flora is also a primary suspect. Using the existence of the endotracheal tube, this bacterial colonization will now have a direct access to the lower respiratory tract. Biofilm forms on or in the tube from oral or upper airway secretions, which can be noted within 12 hours of intubation. This contains an immense amount of bacteria that can be transferred into the lungs through ventilator-induced breaths. The presence of an endotracheal tube would also mean that the normal breathing pattern is altered. The function or the upper respiratory tract is bypassed which means the air must be heated and humidified by other means. Things that normally would elicit a cough reflex will no longer trigger it since the endotracheal tube eliminates/decreases the cough reflex. This is important because we know that the cough reflex is our body’s innate response to foreign objects that go down the trachea. Mucociliary clearance is another defense mechanism that protects the lungs from stimuli such as inhaled allergens, pollutants, and pathogens. It will also be impaired by the endotracheal tube. The absence of these innate defense mechanisms would definitely increase the probability of bacterial colonization through repeated aspirations of colonized organisms. Most patients attached to a mechanical ventilator have an altered state of consciousness and need a nasogastric (NG) tube for feeding purposes and administration of medications. The nasogastric tubes can cause esophageal sphincter to loosen up and not fully close, which could lead to gastroesophageal reflux. Since the stomach has a stockpile of bacteria, aspiration of gastric contents will serve as the one-way ticket of bacteria to the upper respiratory tract where it can colonize. How to diagnose a patient with VAP? Diagnosing patients with VAP can be frustrating. That’s because the patients are already intubated and in a serious condition and you really do not want or need to cause any more harm. Clinical findings, sputum tests, and radiography are one of the best ways of diagnosing the disease. Invasive diagnostic procedures, such as a bronchoscopy, carry risks with it but are more efficient. Radiography shouldn’t be the lone basis of diagnosis as other diseases could be a differential diagnosis, such as pulmonary edema, pulmonary embolism, pulmonary infarction, respiratory distress syndrome, atelectasis, and/or alveolar hemorrhage. Sputum obtained for testing is not a reliable test to diagnose VAP but could be used for culture and sensitivity results to assist in choosing the correct medication (antibiotic) to be used. Chances of having VAP increase if the patient exhibits clinical symptoms such as increased temperature, a high white blood cell count, and purulent secretions. Basically, you treat VAP with proper antibiotics. Medications that are prescribed should match the bacteria that is present. Initially, while no information about the causative agent is available, a broad-spectrum antibiotic would be administered until culture and sensitivity results are available. Then you can proceed to administer the appropriate antibiotic. Use NPPV (non-invasive positive pressure ventilation) whenever possible, as this significantly decreases the chances of VAP as opposed to intubation and mechanical ventilation. Use daily weaning trials to assess the patient’s respiratory muscle strength and ability to be removed from the ventilator. The risk of VAP is associated with the length of time on the ventilator, so naturally, if you can decrease that amount of time, you will decrease the chances of VAP. Elevate the head position of the bed. This has been shown to reduce the chances of gastric aspiration, which causes VAP. Strive to keep the head of the bed elevated to 45 degrees. Use proper hand hygiene. This goes without saying, however, you should always wash your hand with soap and water upon entering the patient’s room, then again once you leave the room. Practice oral decontamination on the patient by doing mouth-care regularly. Cleaning out the bacteria in the mouth decreases that chances of VAP significantly. Don’t break the circuit of the ventilator. Keeping the circuit closed as much as possible has been shown to decrease the chances of the patient obtaining VAP. This means that you should change the circuit only when it is visibly soiled. For more information on what is VAP and how to prevent it, watch the video below. 1. What does VAP stand for? 2. What is ventilator-associated pneumonia? 3. What types of patients are at the highest risk for acquiring VAP? 4. What percentage of patients in the ICU can colonize with a bacteria in the first 24 hours? 5. VAP is associated with intubated patients which puts them at high risk for what to occur? 6. What must be continuously monitored, otherwise, it can cause VAP because it is not fully protecting the airway? 7. If there are folds in the cuff it can allow what to happen? Secretions from the mouth to enter the lungs. 8. VAP is caused by the microaspiration of what? 9. 60% of VAP organisms are usually what? 10. What are the three most common gram-negative organisms associated with VAP? 11. VAP organisms are now commonly changing to what? 12. What is the most common gram-positive organism associated with VAP? 13. What are two types of injuries or infection that can contribute to VAP? An injured tracheal wall, or an injured/infected nasopharynx. Alcoholism, antibiotic therapy, hypoxemia, bronchoscopy, intubation, tracheostomy, hypotension, nasogastric tubes, surgery, and malnutrition. 15. Patients who have been diagnosed with VAP usually have a fever higher than what? 16. What occurs with the WBC count on a patient diagnosed with VAP? 17. What kind of secretions typically does a diagnosed VAP patient have? 18. What is shown on the chest x-ray of a newly diagnosed VAP patient? 19. What type of ventilation puts patients at a lower risk of developing VAP? 20. What is the #1 method for preventing VAP? 21. What should the position of the head of the bed be at? 22. What two ways can oropharyngeal cleaning be done in order to prevent VAP? (1) Oral hygiene, and (2) clear secretions above the cuff. 23. Once a patient is diagnosed with VAP, what needs to be obtained to get the correct antibiotic started? You will need to obtain a Sputum sample. A bronchoscopy may be needed to get a good sample. Also, you want to avoid the overuse of broad spectrum antibiotics for too long. 24. VAP may be delayed by how many days? 25. What type of ventilation lowers the risk for VAP in COPD patients? 26. What is an effective strategy to prevent VAP and atelectasis in a patient? 27. Why is VAP important? It increases morbidity, the length of stay in the ICU, and failure to diagnose VAP increases the risk of mortality. 28. What is the mortality of VAP? 29. How does VAP occur? Microorganisms colonize from the teeth and oropharynx forming a biofilm on the inside of the endotracheal tube. Then, they migrate past the microchannel and are blown into the distal respiratory tract by the ventilator cycling. 30. What 3 organisms can cause VAP? 31. Which 3 viruses commonly cause VAP? 32. What fungi can cause VAP in immunocompromised patients? 33. What does the early development (<96 hours) of VAP usually mean? The patient is sensitive to the antibiotics. 34. What does the late development (>96 hours) of VAP usually mean? The patient is at an increased risk of antibiotic resistant organisms. 35. What is the gold standard of VAP diagnosis? Pus in the alveoli on histopathology. 36. What combination of investigations is used for VAP diagnosis? 37. What are the clinical signs of VAP? Altered white blood cell count, cough, crepitations, dyspnea, fever, purulence, and wheezes. 38. What four radiological changes may be seen in VAP? (1) Alveolar shadowing, (2) air bronchograms, (3) fissure abutment, and (4) new chest x-ray infiltrates. 39. What would the role of a biomarker in VAP? To speed up and improve the diagnostic accuracy. 40. Nosocomial infections and ventilator-associated pneumonia are common in which type of patients? Critically ill patients, patients with catheters or monitoring devices, vented patients, and patients in the ICU. 41. Why is VAP associated with intubated patients? Because they are at a high risk of aspiration, the cuff may not fully protect the airway, folds present in the cuff allow for secretions from the mouth to enter the lung. 42. What other factors may cause VAP? Injury to the tracheal wall, or an injury or infection to the nasopharynx. 43. What 4 things are commonly associated with the diagnosis of VAP? (1) Fever of more than 38.2, (2) elevated white blood cells, (3) purulent secretions, and (4) new infiltrates on the chest x-ray. 44. What other things are commonly associated with VAP? Atelectasis, pulmonary embolism, lung contusions, ARDS, and drug reactions. 45. What are ways to try to prevent VAP? Wash your hands, noninvasive ventilation, elevate the head of bed 30 degrees, avoid gastric large volumes, appropriate tubing changes, oropharyngeal cleaning, and decontamination, closed suction or sterile suction, careful use of inline nebs, and the proper care of trach tubes. 46. What are 3 ways to treat VAP bacteriologic? (1) Obtain a sample to use the correct antibiotic, (2) avoid overuse of broad-spectrum antibiotics, and (3) may need a bronchoscopy in order to obtain a good sputum sample. 47. Why is it important to identify the specific bacteria? So that you can treat it with the most effective antibiotic. 48. How would you decrease the risk of aspiration? 49. Should the vent tubing be changed regularly in order to prevent VAP? No, not unless it is visibly soiled. 50. Why is it important to move the patient in order to prevent VAP? Now you know exactly what is VAP and how to be more aware of the infection. Hopefully, this will help decrease the incidence of VAP in your work facility and around the world. You can take the knowledge that you gained from this article and use it to do everything in your power to ensure that your patient do not acquire VAP while on your watch. In the unfortunate event that it does occur, and it will, you now know how to diagnose the disease and treat it properly.